Harvard’s African and African American Studies department is located in an intimate area on the second floor of the Barker Center. Some walls are covered in accolades for faculty members and students. Others are adorned with photographs of luminaries including W.E.B DuBois, Richard Wright, and Frederick Douglass. Still others are hung with more than 30 black and white portraits of Harvard’s first black students. In 1969, the Af-Am department was formed in response to student activism that had been spurred by the death of Martin Luther King Jr. in 1968. Since then, the department has been home to a number of leading intellectuals, such as Henry Louis Gate, Jr. and Cornel R. West. But over the past ten years the Af-Am faculty shrunk to bare bones after University President Laurence H. Summer’s contentious tenure spurred the departure of five prominent scholars. Only recently have some of these individuals returned. On a bulletin decorating a wall in the department’s lobby, newspaper clippings from magazines such as the “Boston Globe” herald, among other things, the much-anticipated return of Marcyliena Morgan, a scholar on hip-hip, to the Af-Am faculty. Morgan was denied tenure under Summers. While the department has sought to regain its footing, Professor of Af-Am and Philosophy Tommie Shelby has been a constant presence—even as many of his colleagues sought positions elsewhere. A little further down the hallway from the lobby, chatter and laughter can be heard through an open door. Inside, Shelby sits with his back to an open window that looks out at the courtyard in front of the Barker Center. 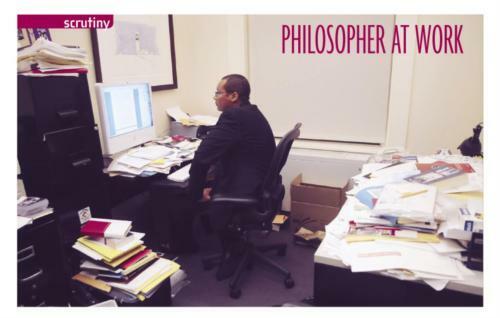 His office seems to shout “A philosopher works here!”—papers, books and printouts are strewn across nearly every flat surface, including the floor. “I’m messy, that’s all,” he says. “There are papers on my desk that are probably three or four years old.” He offers no apologies, only a rational explanation: he can be productive even in the midst of chaos. In fact, he would prefer to read the news rather than clean. It’s a more productive form of procrastination, he insists. After only a couple of minutes of conversation, a few things are apparent about this man. He is relatively young, or at least, youthful, and he is unwilling to indulge in talk of his own success. His conversation is at once colloquial and cerebral; “likes” and “you knows” are intermixed in discussions about “ethical commitments” based on race and Karl Marx’s “controversial doctrine.” At only 40 years old, Shelby is one of the younger tenured members of Harvard’s faculty—and his appointment came just nine years after he received his doctoral degree in philosophy from the University of Pittsburgh. Even so, Shelby insists that he isn’t that interesting. His life, he says, consists primarily of “fortuitous” events, few of which resulted from significant planning on his part. It is only after some probing that Shelby laughingly admits that he may be prone to modesty. Indeed, in a department that has its share of high-profile faculty members both past and present, Shelby stands out as decidedly understated. Judging by only his meticulous physical appearance—a vice, he insists—and the apparent speed with which he was awarded tenure at one of the nation’s most prestigious universities, one could easily assume that Shelby was born with a silver spoon in his mouth—or at least a leather bound edition of Karl Marx’s “Das Kapital” in his hands. Shelby begs to differ. He describes himself as a high school senior: a basketball-playing, track-running jock. “I wasn’t really interested in school in high school. I thought maybe I would go to college and play [basketball],” he says. It wasn’t until the end of his junior year that he noticed that while the white, second-string high school players graduated and went to college, his black friends graduated with their dreams of an NBA future indefinitely postponed. As difficult as it may be to believe, this well-groomed academic almost found himself at risk of not attending college, In the spring of his senior year, Shelby sat in a meeting with his guidance counselor who was understandably curious about his future plans—Shelby had yet to apply to schools. He says that he was simply unaware that he had missed the fall deadlines. Luckily, his alma mater, Florida Agricultural and Mechanical University—one of a group of Historically Black Colleges and Universities—had a second round of admissions in the spring. As the eldest of six children, he moved around Jacksonville, Florida, living first with his mother and his adoptive step-father, then with his grandmother while he was in high school. Shelby’s mother had him when she was 17. She did odd jobs and domestic work to pay the bills. His grandmother raised him in high school and would frequently help out with childcare. Like many students at Florida A&M, Shelby spent his freshman year focused on business aspirations. He says that it was not until his second year of college that he realized business administration was not to be his vocation. At Florida A&M, Shelby was certainly not the norm. Most students, he says, sought to gain admission to the School of Business Administration, a program that was successful in landing students business school positions and jobs after college. Shelby, on the other hand, embarked on a period of discovery that would eventually lead him to his calling: philosophy. He began flitting through departments—first psychology, then sociology. Finally, in a course on religion, one of his professors pointed him in the direction of philosophy. Fast forward 18 years since his graduation and Shelby says he is still fascinated by the things that caught his attention as a college student. As a Marxist philosopher, he is not perturbed by the fact that the popularity of in Marx has waned in the years following the fall of the Soviet Union. “I had been engaged by Marx since I was an undergraduate and took my first course on political philosophy, studied Marx and thought, wow this guy is interesting,” he says. So engaged in fact, that he attended graduate school at the University of Pittsburgh and wrote his dissertation on Marx—a dramatic transformation from the college freshman who knew nothing of philosophy as a field “at all.” He graduated as Florida A&M’s only philosophy concentrator in 1990. “You write about what you think is interesting and you hope that there are people out there who want to read it,” he says. Or publish it, as the case was. Shelby says that when he began to publish, he sensed a resistance in that arena. “It could be that the work wasn’t that good—I don’t know,” he says jokingly. In 1999, Shelby was an assistant professor at Ohio State University, halfway through a short two-year appointment. He would be drafted to Harvard just a year later. It was during this year that he received his first invitation to give a lecture at Howard University, not on Marxism—the subject to which he had devoted much of his adult life—but on race. He spent that summer writing his lecture, which was a response to the work of his soon-to-be colleague at Harvard, K. Anthony Appiah, professor of philosophy and Af-Am studies. And in September, he delivered his lecture on black solidarity at the Alain Locke Conference on Race and Gender. Just a year later, in 2000, Shelby was hired as a joint assistant professor in the Social Studies and the Af-Am departments. He taught Social Studies 10—the concentration’s sophomore tutorial that focuses on social theory—where he could return to Marx. At that time, the Af-Am Department had reached what Shelby calls “critical mass.” With a burgeoning faculty that included Appiah and West, Shelby says he was anxious to work with these scholars who he had long admired. Just two years later in 2002, a metaphorical earthquake would rock the Af-Am Studies Department. After a fall flap between Summers and West ended in a bitter feud, West announced he would be leaving Harvard to return to Princeton. According to the “Boston Globe,” West said he felt disrespected when Summers questioned his scholarship and asked to monitor his research. Summers has declined to comment on the situation. Before West’s announcement, Appiah had announced in January that he too would be leaving for Princeton. In one fell swoop, the department had lost it most popular and prolific professor and another member of the program’s “Dream Team.” Between the 2002 departures and the end of Summers’ tenure in 2007, the relationship between Summers and the department was tenuous at best, and enrollment fell. The bottom of the barrel finally arrived in 2005 when the department lost three others: Laurence D. Bobo, a professor of sociology and Af-Am, Marcyliena Morgan, his wife, then an Associate Professor of Af-Am, who was denied tenure under Summers, and Professor of Government and Af-Am Studies, Michael C. Dawson. Both Shelby and the department have gained much ground since those days. Both Morgan and Bobo returned to Harvard—Morgan with a long-sought tenured position. Shelby, the director of the undergraduate program, says that the department has its sights on continuing the trend of reconciliation in the post-Summers years—even while he anticipates that the current economic crisis will limit their ambitions. And, with the merging of African studies into the department, he says that they have come a long way in a quest to “fill out” the program. The self-described even-keeled, cool-operator, Shelby appears as if he has always belonged in the elite club of tenured Harvard professors. There is little evidence of the tremendous changes that the last ten years have brought. No longer a detached high school jock, Shelby dislikes exercise and prefers listening to jazz with a glass of wine. Shelby says he hates running and rarely returns to the basketball court. The arrival of his 14-month-old daughter has made movie nights and dinners with friends a rare treat. (“It’s sort of a different world now,” he comments.) And he has found a steady foothold in Harvard’s intellectual community with or without the presence of his departed mentors. “That’s not bad,” he says with a laugh. Not bad, indeed.